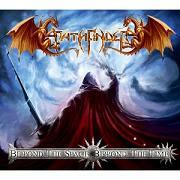 Review: "Pathfinder: Beyond the Space, Beyond the Time" - Sea of Tranquility - The Web Destination for Progressive Music! Polish symphonic power metal act Pathfinder have put together an impressive platter of sounds on their latest CD Beyond the Space, Beyond the Time. It's pretty obvious that the band have listened to their fair share of Rhapsody of Fire, Dragonforce, Helloween, Kamelot, and the like, so while this latest CD won't rank as one of the most original albums of all time, it's well played and chock full of memorable symphonic metal anthems. Sweeping keyboard orchestrations, chugging riffs, blinding guitar solos, frantic rhythms, and soaring vocals...that's what you are going to get a lot of here, and trust me, that's perfectly fine. Pathfinder are a talented bunch for sure, so let's meet them; Simon Kostro (vocals), Slavomir Belak (keyboards), Arkadiusz E. Ruth (bass), Karol Mania (guitars), Gunsen (guitars), and Kamil Ruth (drums). There is no shortage of ripping guitar solos (yep, the wild Dragonforce kind) and huge, orchestral keyboards, so if you like that sort of thing, you'll find this CD a real feast for the ears. Lyrically, the band have a lot going on, as their tales of mystery, fantasy, and mythology meshes perfectly with their bombastic, progressive/power metal onslaught. Hard to pick favorites among these many tracks, as they all seem to almost blend into each other as if it was one long concept suite, but "Pathway to the Moon", "The Whisper of Ancient Rocks", "The Demon Awakens" (which has a few cool black metal styled vocals which sound great next to Kostro's soaring pipes), "Sons of Immortal Fire", and the epic title track, which is a symphonic speed metal lovers delight, complete with blazing guitar & keyboard solos, plus a wide range of vocal styles. Complete with stunning, fantasy tinged artwork, Beyond the Space, Beyond the Time is one impressive release, though yes, it's quite over the top and for some will be cheesey beyond belief. Let's face it, you either love this style of metal or you don't, but I'm guessing those who dig it will certainly have much to celebrate after getting a load of this new one from Pathfinder, who are sure to be a band that will be discussed in length after folks get to hear this one. Pathfinder are the first band to rear their heads from Karl Walterbach's new label Sonic Attack. For those unaware of Walterbach's heritage, it was his Noise label who changed the shape of the metal world by unleashing bands such as Helloween and Kreator on the unsuspecting unwashed hordes of music fans. It wouldn't be ridiculous to suggest that Noise were actually one of the most ground breaking labels of their time, so it was with baited breath that I first slipped Beyond The Space, Beyond The Time into the CD player to discover what can best be described as symphonic speed metal with operatic vocals! The album was initially released in Germany under Pathfinder's own steam and to huge critical acclaim, with accounts of genre smashing music and tales of classic debuts. So is BTS,BTT really that good? Well yes...and no. There's no denying that the riffs gallop, the drums race and the keyboards soar, neither is their debate over whether Pathfinder write chest puffing, drum beating 100 mile-an-hour anthems. It's just that when fourteen tracks of fret pyrotechnics hit you in rapid succession for seventy minutes, it is a bit samey. Karol Mania is the undoubted star of the show, with his fingers a constant blur on the fretboard (honestly it's like Dragonforce played at 45rpm! ), but the manic double bass pounding of Kamil Ruth matches him note for beat and Slavomir Belak on keyboards and second guitarist Gunsen add swathes of symphonic atmosphere to the speedster obsessive. Simon Kostro brings an almost combustible vocal style to the songs and with an opera singer in the shape of Agata Lejba-Migadaiska adding backing arias, the voices on this album are every bit as full on as the music. At times it all makes for a spellbindingly blast of, mythical manic mayhem, but equally at times Kostro's Justin Hawkins (The Darkness) like squeals all become a bit too much for comfort and verge on the edge of parody. The most surprising thing about Pathfinder is that with a sound so firmly based in the symphonic Scandie scene, they actually hail from Poland, which these days is far more renowned for its extreme metal and down beat prog rock. They do however use their influences well and while a plethora of bands are leant on to create the Pathfinder sound, there isn't actually one other specific band who you could suggest are even trying to sound like this. That in itself is quite an achievement, although it isn't quite a recommendation in itself. With the surprises that Noise records served up over the years, I should have known that the first release from Sonic Attack wouldn't be straight forward and while there is a huge amount of interest on this album, it isn't a completely unmitigated success and could definitely do with being at least fifteen minutes shorter.